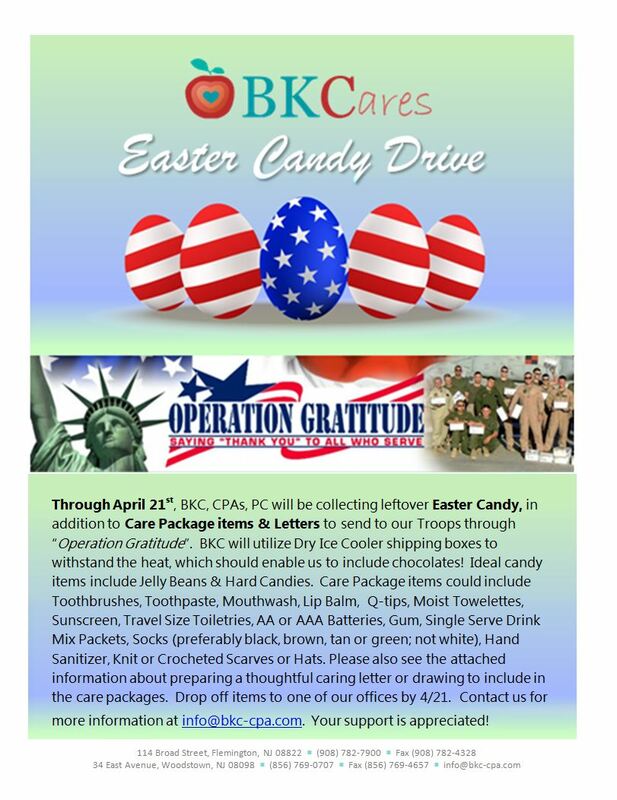 Through April 21st, BKC, CPAs, PC will be collecting leftover Easter Candy, in addition to Care Package items & Letters to send to our Troops through “Operation Gratitude”. BKC will utilize Dry Ice Cooler shipping boxes to withstand the heat, which should enable us to include chocolates! Ideal candy items include Jelly Beans & Hard Candies. Care Package items could include Toothbrushes, Toothpaste, Mouthwash, Lip Balm, Q-tips, Moist Towelettes, Sunscreen, Travel Size Toiletries, AA or AAA Batteries, Gum, Single Serve Drink Mix Packets, Socks (preferably black, brown, tan or green; not white), Hand Sanitizer, Knit or Crocheted Scarves or Hats. Please also see the attached information about preparing a thoughtful caring letter or drawing to include in the care packages. Drop off items to one of our offices by 4/21. Contact us for more information at info@bkc-cpa.com. Your support is appreciated!